For a fascinating look at bygone farming days, head for the annual Antique Engine and Tractor Show held at the Jay County Fairgrounds in Portland in east-central Indiana. This tiny town's population swells from 6,500 or so folks to more than 100,000 in late August as old-iron aficionados, parts vendors and antique dealers converge. It's quite an event. This is one of the largest shows of its kind in North America. 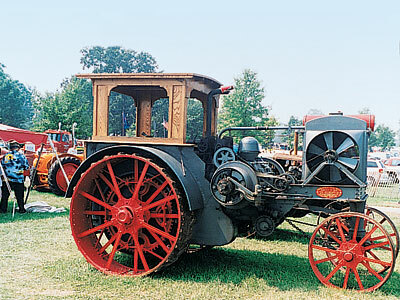 You'll see huge antique gas engines and lots of old-time tractors, including steel-wheelers and coal-fired machines. I love watching old-timers run antique saw mills and threshing machines, browsing through the flea market and enjoying nightly live music and great food. Don't miss the all-you-can-eat pancake and sausage breakfast! Portland is where U.S. Highway 27 meets State Highway 26, about 25 miles northeast of Muncie and 10 miles west of the Ohio state line. The tractor show is held during the fourth week in August; in 2005, it's slated for August 24-28. For details, call the Jay County Visitor and Tourism Bureau at 1-877-726-4481 or Al Confer from the Tri-State Gas Engine and Tractor Association at 1-765/ 369-2656.